Cold laser therapy, also called low-level laser therapy, is now offered to treat pets with arthritis, tendon or soft tissue injuries and to promote wound healing. A laser is simply a beam of light that travels at a specific frequency, allowing the laser to generate heat and penetrate tissue. During therapy, a laser wand is applied onto the affected area for 10-20 minutes, depending on the severity of the issue. This reduces pain and inflammation and promotes healing. What will your fuzzy friend think? 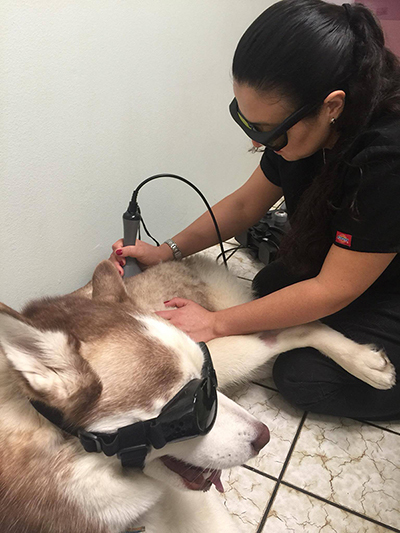 Most dogs find laser therapy relaxing and lay down comfortably while recieving treatment. Your pet won't experience any side effects and will feel great after treatment. His pain will have decreased, his mobility will have improved, and he'll feel more like his old self! Call us today to discuss how cold laser therapy may help your buddy!